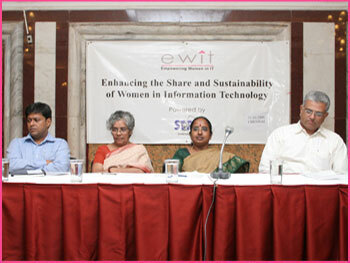 eWIT's networking event, with a focus on SMEs, happened on 31st October at Hotel Savera. The main objective of this event was to bring together the existing members and potential members of eWIT in order to share their ideas and thoughts on what activities eWIT should undertake to achieve its vision. The event was designed in such a way to increase the participation of the individual and corporate members and also to hear from some of the industrial leaders, their thoughts on the issues faced by women today in IT. 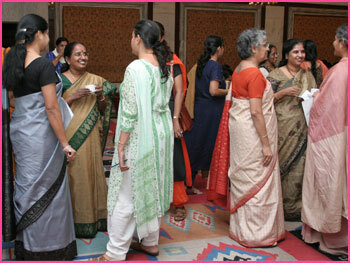 Around 50 women participants from various IT and ITES companies from Chennai participated in the event, braving the incessant rains that Chennai was facing. The chief guests of the event included Mr. Prabhakar Ram, Director of Newgen Imaging Systems, Ms. Vijayalakshmi, Delivery Director, Xansa India Ltd and Mr. Bala J. Raman, President & Co-founder, Congruent Solutions. After the welcome address and introduction of speakers by Ms. Kalyani Narayanan, Ms Vijayalakshmi Rao made a brief presentation on eWIT, including relevant statistics on women in IT in India as well as some of the upcoming programs of eWIT. Following this, the guest speakers shared their experiences in the industry and acknowledged the women's role and contribution to the industry and the unique issues that women face today. All the guest speakers agreed on the need to create flexible work options for women, from an individual as well as business standpoint. Mr. Prabhakar Ram shared how the knowledge industry has evolved as the right place for women to be in with a win-win approach. Ms Vijayalakshmi of Xansa talked about the different influential factors that can be used to address some of the issues that workingwomen face today. She stressed the need for ensuring data protection for work-from-home options, improving the infrastructure in and around the OMR and Siruseri (such as schools and daycare centers) and also the need for women to learn better time management from the women of the western world. Mr. Bala J Raman talked about how Congruent Solutions supports workingwomen to balance their personal life and professional life by providing options such as flexi-time and work-from-home and the direct positive impact this support system has on productivity and efficiency. Following the guest speakers, the participants formed panels and discussed about what, in their views, are the prominent problems that women faced today and what eWIT can do to help them. A representative from each of the panels shared what they had discussed. Some of the salient points that came out of the discussions are (1) eWIT to act as the intermediary platform where women who are looking for alternative working options such as part-time/tele-commuting/work from home, flexi-time etc. can post their resumes. The corporate using this portal can also post such job opportunities (2) an interactive web site, where eWIT members can post their queries.